A shape to win Formula and Windfoil events! The predecessor shape “Formula 4” was crowned with the Formula Windsurfing World and European Champion title overall men, youth and masters and has also placed the most 2nd and 3rd positions in the last 2 years. Later in the season this shape also surprised the Windfoil world and won the foil discipline at the World Cup event in Sylt. The shape in combination with the hollow construction is simply unique and at first, we thought it couldn’t get any better but we were wrong…! The first prototypes for 2018/19 simply killed it and made the whole testing and pro-team including shaper Patrik Diethelm speechless! We are proud to have followed our philosophy and refused to launch additional products just for the sake of business. Many foil board prototypes from other brands have been tested throughout the 2017 racing season and during the World cup event in Sylt the best riders selected the best shapes and competed against each other. The result proved that the PATRIK Formula 4 is the best choice for riders who want to win windsurf and/or Windfoil races. To conform with the new PWA rules for foil events we built a 91cm wide Formula board which is not only a foil board but also the Windsurf LIGHTWIND weapon for those who do not want 1m wide boards. Our unique hollow construction is so technically advanced that it is difficult to describe. The compact and simple name for our construction “AIRINSIDE” stands for many parameters. 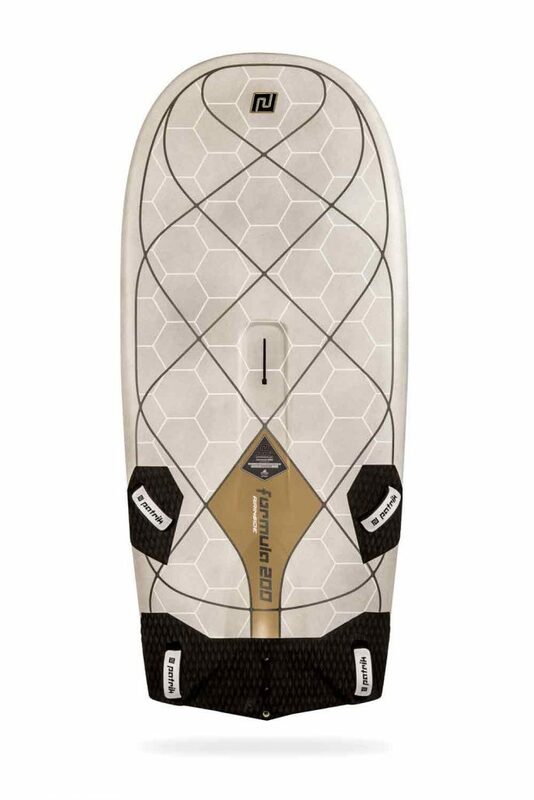 The complete hull and internal structure contains an average of 36m2 of Prepreg Carbon (10 times more than any other windsurf board on the market), and 6.5m2 of Honeycomb sandwich material. The complete hull and all components such as fin box, mast track, strap inserts, cutouts, etc., are built in one single shot with only one 20mm diameter opening which is needed to connect the air pressure. The materials are cured under pressure for 6 hours at 165°C. 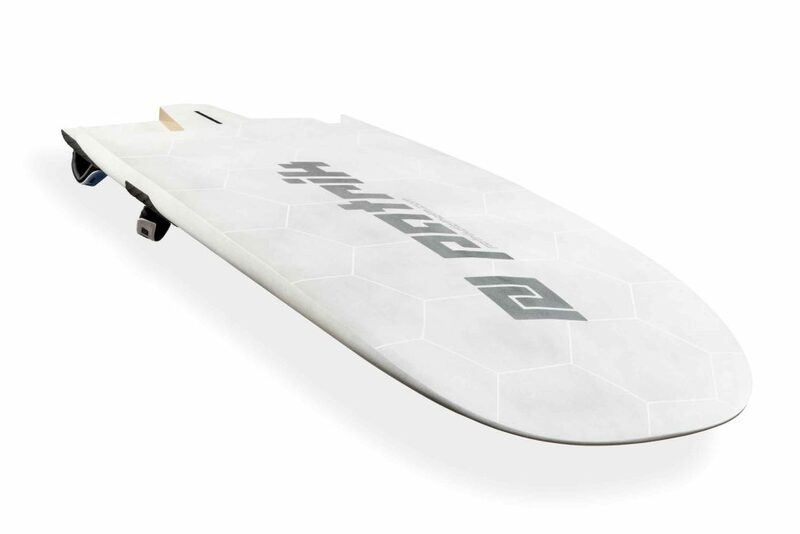 Up to 1kg lighter than any other board in the same category. Highest weight/strength ratio compared to any other construction on the market. Fin box, mast track and strap inserts: Except for the footstrap plastic insert all parts are from Carbon and Honeycomb. The tensile and compressive strength of every part has been mechanically tested. It is so strong that either the pressure gauge stopped at 1 tone, the webbing of the straps ripped, the screws snapped and/or the thread pulled out. Every board is foil ready and the fin box is by far the most solid box on the market. The fin and/or foil sits inside the fin box as if it were built out of one piece with the board. 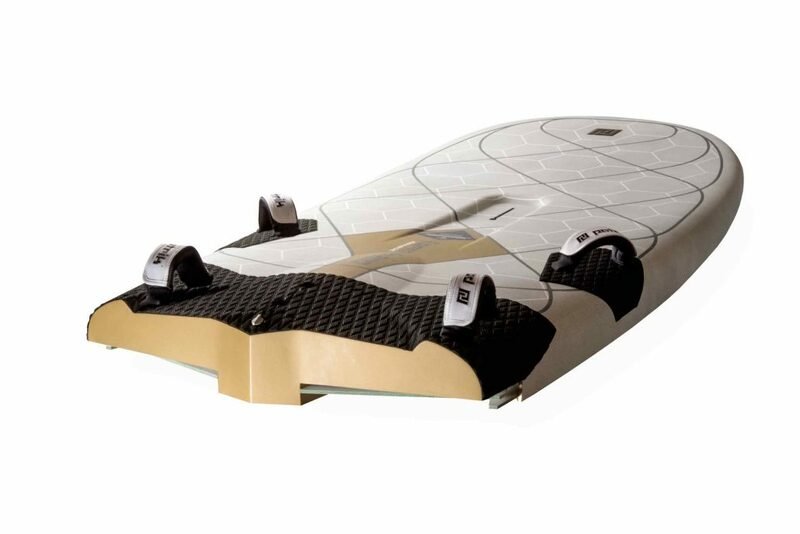 Every foot pressure is transferred directly onto the foil and you can steer and control your gear with less effort and fly over the water in a much more relaxed body position. The full hull layers in combination with the internal structure allow control of the twist and flex like a laminated fin. Incomparable precise measurements and finish within the same model/size ensure each board is uniform. It is nearly impossible to improve the boards every year, but our experience with the first hollow construction was totally revolutionary. We took what we loved from the winning Formula 4 and improved what we learned after extensive testing. 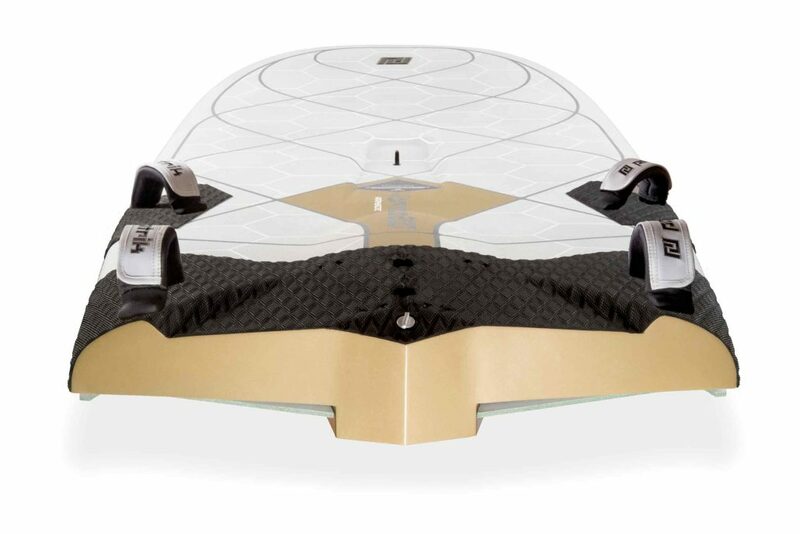 Volume: With the hollow construction the thickness of the board doesn’t significantly affect the weight. For safer tacks the riders requested more volume in the nose area, so we filled in the big deck recess. The additional 15 litres of volume and a flat deck shape is the perfect platform for safe tacks. Deck Recess: We tested different heights of mast foot positions and as a result kept the deck recess for the lower mast track at a similar height but made it smaller to avoid disturbance when walking around the deck. Deck Bump: In 2004 at the Olympic One Design Trials at Lake Garda, the PATRIK-design introduced the deck bump which we now as well applied on the Formula design. Riders can push against it while pumping and you can always feel the centre of the board when not standing in the strap during foiling. Cutouts: To address the demand for more speed, we made bigger cutouts. Cutout Plates: This feature is a simple way to trim the pitch angle of the board to your custom specifications. The new boards are delivered with double plates and ventilate the cutout area similar to an “air pipe”. Strap and Mast Track Position: Building on our team’s experience with the Formula 4, most riders positioned all straps in the very back holes. On the new Formula we moved all inserts and mast track 20mm back to give more options to individually trim the new shapes. Bevels: Since the lightweight construction has less impact into chop/waves, we were able to reduce the bevel angle which increases the rail thickness to improve the flotation and tracking upwind at the same time. The Champion in speed and agility of Formula boards. The lightweight construction opens so many new doors because the size and volume does not affect the agility and liveliness anymore. 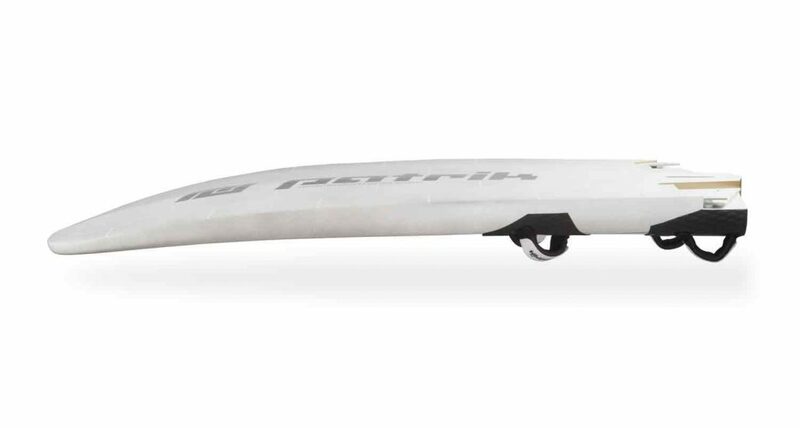 This thicker shape looks like it is specially made for light wind, but in lineup tests the pro riders, testers, and even female lightweight rider Karin Jaggi, (62kg), were all astonished how easy it is to control. The shape is identical to the Formula 180 but 2cm thicker and brings the same advantages with it. Thickness: The extra 2cm results in a more floaty platform which makes planing easier, goes over waves and chop with less sticking, and makes tacking more forgiving. Rails: The additional 2cm rail thickness improves upwind tracking. No matter which course you are on the taller rails float much higher over the water preventing pearling and sticking. The flagship in the history of PATRIK Formula boards. Windfoil, as we see it today, is definitely in development. So far our riders have shown it does not take a specialized board to win races. The PWA world tour has set their rules to a maximum 91cm board width while many national associations have kept the Formula Windsurf rules and simply allow foil. The new Formula-Foil 91 is derived from the formula shape and has been reduced by 9cm in the center line. 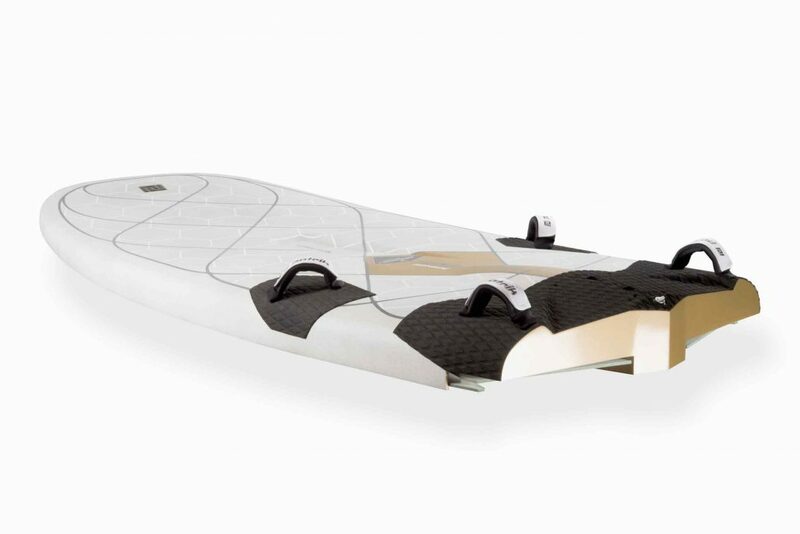 It is a LIGHTWIND KILLER for windsurfers who do not want 1m wide boards and a Foil board for those who wish to compete in the PWA foil events. This board is not registered as Formula board. Derived from the Windfoil winner to windsurf on the water and in the air.